I Want To Make A Difference Now! is the title of the new book by Don Parrott, President of Finishers Project. The book deals with the major issues mid-life adults need to sort through when considering how to invest their lives to make a lasting impact. What about the financial needs? What kind of role could I play? Is there a fit for me? How Do I Know If This Is What God Has For Me? Read this book if you're in your 20's and 30's to embrace life's demands and build character. 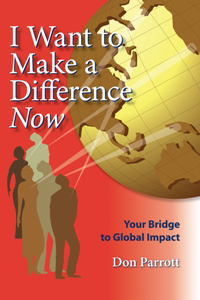 Read this book if you're in your 40's, 50's or 60's to chart your next steps in making a global impact! Click here to order from the publisher, NextStep Resources (also available on Amazon).